If you can machine things out of Aluminum, you are way ahead of me!!!! The Porters came with couplers that not only swiveled like in the picture above, but also came with couplers for both heights. I can't be sure it would work for the caboose with the fixed body mount couplers on short radius, the only way to find out would be to experiment and try it. My absolute preferred method would be to do whatever you could to widen the radius to at least 8 ft and preferably 10 foot. since you can't the only solution that would be sure to work is to modify the caboose by adding truck mounted couplers and removing the body mount couplers. Chuck C has shortened that caboose and that is why it works on tight radius I am trying to post some photos for him. Maybe they will give you some ideas. I cannot emphasize enough the idea of wider radius curves, I feel you will regret the shorter radius curves if there is any way you could have made them wider, but didn't. I strongly agree with Bill. Occasional running, like around the Christmas tree is fine, but constant year round running on tight curves is a real problem. There will be significant wear on your trains and track. Not to mention a lot of black dust that is hard to remove from your carpet under the track. That is a mixture of brass from the metal wheels grinding away the inside of your outside rail and plastic dust from the brass track grinding down the plastic wheel on you rolling stock. I know someone who has to replace his 4' diameter curves every few years, because the rail head is ground down enough for the engine to fall down between the rails. This also puts a lot of stress on the engines motor and gears. If it is at all possible use 8' diameter curves. If you can't do that LGB's R2, 5' diameter, would improve things. I got some eye screws this afternoon. It try to fix up another manufacturer's truck with a Bachmann coupler and spring retainer tomorrow and post some pictures. The only problem I see with upgrading to 8' curves is going to be the price, but I can see where replacing 4' curves every few years would cost more. Then I've got the cost of replacing train wheels on top of that. Either way, the layout I currently have is only a small 6x9 nailed to the floor in my room and its not really much a layout anyways. Needless to say, this thread has got my thinking a lot more of building a new layout than it has me going and buying a caboose. I've been collecting large scale since 2010 on and off and even though I've been doing it this long, I'm still very much new to the hobby. Really appreciate all the advice I'm getting here. Small layouts are OK, but in large scale do have the limitations we discussed above. So while you are looking into a larger layout you just need to use what you already collected that will run on the layout you have. At least that way you can still run trains. When I was in the military, I even made point to point shelf layouts along two walls. I was at least able to use wide curves and equipment that would run on wider curves. It was better than having no railroad at all, even though I was unable to have the full circle. 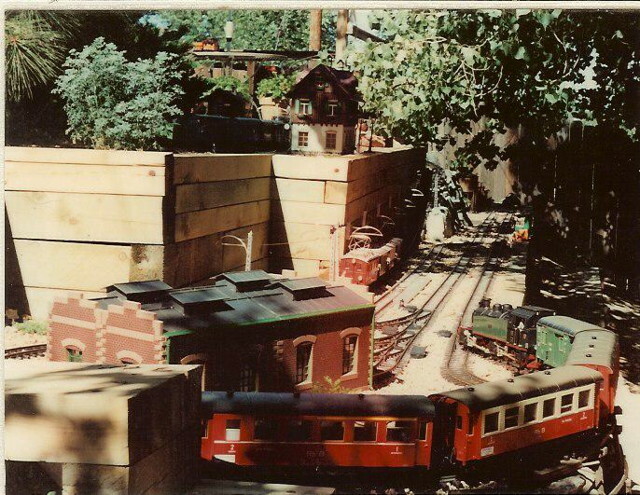 I always had fun no matter what I had, and the joy of always dreaming about the "wonder" layout I might have in the future. Thanks for going through all the trouble to show you method using the screw eyes. I was thinking maybe it should have a separate post. I was wondering the same thing. I'll start a new thread. The five foot diameter curves (LGB R2) would fit in your space. If you can even get 4 pieces and put a piece of 5' diameter curve at the beginning and end of each semicircle it would help. The transition from the straight to the curve won't be as sharp. The R2 curves are also 30 degrees, so they will not effect your circle. 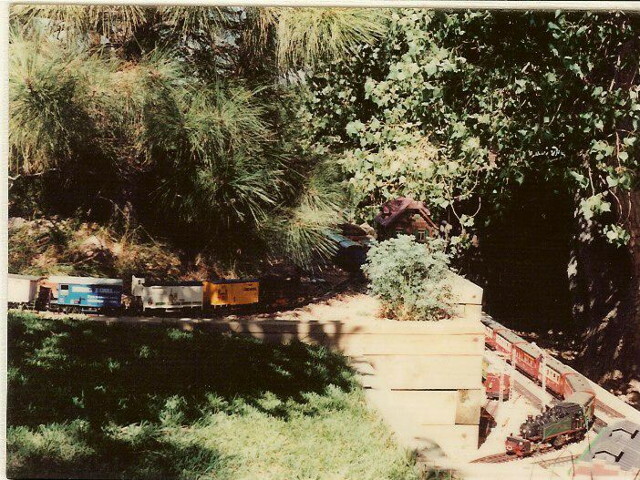 My first garden layout was when we lived in Denver. I had to terrace a slope on the side of the yard for the lower loop. This involved building walls and cutting back into the slope. At one end I had to use the LGB 5' diameter curves. I had a siding of 4' d curves inside the 5'ers. I did not have any problems with excessive wheel or track wear with the 5' d curves. There is a really big difference in performance between the 4' and 5' diameter curves. I could run Moguls and Mallets without any problem. Your idea of using a bent wire would also work. I had thought of drilling two holes in the tongue and cutting the small end of a paperclip off and sticking the "U" into the holes and gluing them. Anything to form a loop would work.